It’s time for a new start. It’s time for a clean break in bad eating habits and it’s time to kick-start ones that are healthy. It doesn’t matter who you are or what your “health level” may be. 3-Day Refresh can help you turn around old and unhealthy habits and start you down a fresh track into optimal health. During this 3-day system you will cleanse your body and improve the way you feel without starving yourself. 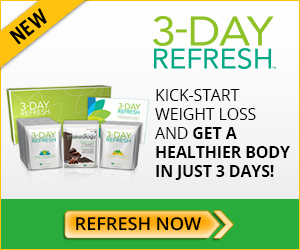 Created by a professional team over at Beachbody, 3-Day Refresh is designed to cleanse and nourish your vital organs to bring your body back into its full state of health. For 3 days you’ll drink: 3 shakes a day, a fiber drink, and as much filtered water as you want. Plus, you’ll also get to choose from a variety of fruits, vegetables, and healthy fats to eat throughout your day so you’re not left with that “starving” feeling. This 3-day cleanse is a revolutionary step into your new healthy lifestyle. So whether you want to lose weight, jump back on the health bandwagon, get rid of the weekend splurges, gain more energy, or simply start a new journey into healthy eating. 3-Day Refresh can and will help get you to where you want to go. Unlike juice cleanses or liquid fasts that mostly tend to be high in sugar and low in protein, 3-Day Refresh is high in protein and fiber so it leaves you feeling full while still removing toxins from your body. And even though you only consume 900 calories a day, you won’t even notice a “hungry” feeling. Because this program is high in fiber, it is recommended that if you’re not used to eating fruits, veggies, and whole grains on a daily basis you should prepare by eating a large salad or other fresh veggies the week leading up to 3-Day Refresh. This will help your body’s ability to complete the cleanse in a more efficient way. And don’t be alarmed if you tend to become gassy. This is just a sign that you need to up your fiber levels. Fiber helps promote satiety as it balances blood sugar, promotes cardiovascular health, and keeps your digestive tract functioning. If gas is becoming a continuous issue “low gas producing” options are available on the vegetable list and the dinner menu guide. During the 3 days you are on 3-Day Refresh, you will partake in a specific set of shakes, meals, and snacks. You will start your day off with the Shakeology shake. If you’re at all familiar with Beachbody you’ve probably heard of this shake already. It’s formulated to improve and support all your body’s vital functions while maximizing energy. It’s packed with potent super-foods that will help maintain healthy blood sugar levels throughout your 3 days. You’re lunch and dinner shake will be a shake called Vanilla Fresh. This delicious shake is rich and protein and helps appease your hunger with 20 grams of plant-based protein, 22 essential vitamins and minerals, probiotics, and a potato protein that will curb your appetite. During your lunch you will also get a choice of one fruit option as well as one vegetable and healthy fats option. In addition to your dinner shake you will also be allowed one option from the Dinner Recipes, as well as one cup of organic vegetable broth if you choose to do so. The third and final shake is the Fiber Sweep. This shake will be taken late morning and will gently and naturally eliminate waste from your digestive system. It has a combination of whole ground flax, chia, and psyllium seed husks. It can help support healthy blood sugars sugar levels, potentially reduce the risk of coronary heart disease, and lower cholesterol. In addition to the shakes, meals, vegetable, and fruit options, you will also get one snack a day along with two cups of tea and all the water you can drink. But don’t worry about getting lost. All of this will be found the Program Guide that comes with every kit. It will give you step-by-step instructions to follow. And if you can stick with and follow this program you will be guaranteed to have more energy, look better, be healthier, feel more refreshed, and maybe even lose a few pounds in the process. 3-Day Refresh is a cleansing program designed to get you back on the track towards health. Whether you are a newbie to the health world or someone who just wants to get rid of the weekend comfort foods, this program can help you achieve your health goals. It’s not hard. It’s just 3 days of drinking super healthy and tasty shakes. You won’t feel hunger but you will feel better. So forget boring juice cleanses and liquid fasts that leave you feeling weak from hunger and try 3-Day Refresh. It’s simple. It’s easy. It’s Refreshing. If you are interested in both the 3 Day Refresh and Shakeology make sure you check out the 3 Day Refresh Challenge Pack – an amazing savings deal!